BL-12RFP $198.33 LED Bollard Light Retrofit Package Equivalent to a 150-watt High Pressure Sodium or Metal Halide fixture. Operating Wattage – 12W. 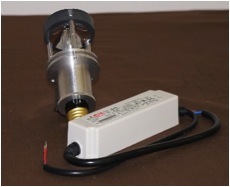 This product may be used in applications that require 100-175W illumination. 100K hour rated life with instant on. Multi-Volt 110v-277v and ROHS compliant. LM-79-2008 tested. HC-11FLM $219.33 LED Floodlight Bronze Fixture 9” Equivalent to a 175-watt High Pressure Sodium or Metal Halide Fixture. Operating Wattage – 11.7W. This product may be used in applications where 150-200W illumination is required. 100K hour rated life with instant on. Multi-Volt 100V-277V and RoHS compliant. HC-11SLM $239.33 LED Spotlight Bronze Fixture 9” Equivalent to a 175-watt High Pressure Sodium or Metal Halide Fixture. Operating Wattage – 11.7W. 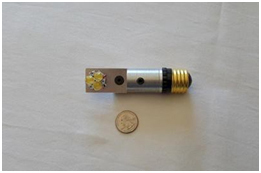 This product may be used in applications where 150-200W illumination is required. 100K hour rated life with instant on. Multi-Volt 100V-277V and RoHS compliant. Existing Street/Parking/Pole lighting fixtures use very high wattage along with 20th Century technology that requires constant maintenance. Metal halide, High Pressure Sodium, Low Pressure Sodium are among some of the most common older technologies that can benefit from an LED retro fit. HC-22-3RFP $495.00 LED Retro Fit for Street/Parking/Pole lighting. Equivalent to a 500-watt High Pressure Sodium or Metal Halide Fixture. Operating Wattage – 38W, ideally suited for 25’-30’ pole. This product may be used in applications where 400- 500W illumination is required. 100K hour rated life with instant on. Multi-Volt 100V- 277V and RoHS compliant. LM-79-2008 tested. Existing Street/Parking/Pole lighting fixtures use very high wattage along with 20th Century technology that requires constant maintenance. Metal halide, High Pressure Sodium, Low Pressure Sodium are among some of the most common older technologies that can benefit from an LED retrofit. Fits most commercial shoebox fixtures. HC-22 WPM $445.00 LED Wall Pack Bronze Fixture 14”, Equivalent to a 350- watt High Pressure Sodium or Metal Halide Fixture. Operating Wattage – 22W. This product may be used in applications where 250-400W illumination is required. 100K hour rated life with instant on. Multi-Volt 100V-277V and RoHS compliant. LM-79- 2008 tested. HC-22 WPDSM $507.39 LED Dark Sky Wall Pack Bronze Fixture 14” Equivalent to a 350-watt High Pressure Sodium or Metal Halide Fixture. Operating Wattage – 22W. This product may be used in applications where 250-400W illumination is required. 100K hour rated life with instant on. Multi-Volt 100V-277V and RoHS compliant. LM- 79-2008 approved. HC-22-3FLM $520.00 LED Floodlight Bronze Fixture 12” Equivalent to a 500- watt High Pressure Sodium or Metal Halide Fixture. Operating Wattage – 38.7W. 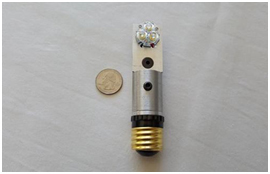 This product may be used in applications where 400-500W illumination is required. 100K hour rated life with instant on. Multi-Volt 100V-277V and RoHS compliant. LM-79- 2008 tested. TL-12-Can/Track Lamp LED retail/residential Can/Track Lamp.